The Nazi transformation of a simple human interaction - the greeting - shows how a shared gesture can usher in the conformity of an entire society. Made compulsory in 1933, the Hitler salute developed into a daily reflex in a matter of months. Spain: Day 327 of 985 of the Spanish Civil War. USA: Acting Secretary of State Sumner Welles denounces the bombing of civilians in China. Spain: Day 692 of 985 of the Spanish Civil War. CBI - China: Day 337 of 2,987 of the 2nd Sino-Japanese War. Day 122 of 124 of the Battle of Henan. USA: The King and Queen of England arrive in Washington DC for a Royal visit. CBI - China: Day 702 of 2,987 of the 2nd Sino-Japanese War. CBI - Mongolia: Day 29 of 129 of the Battle of Khalkhin Gol, a border dispute between the Soviet Union and Japan. Atlantic: The aircraft carrier HMS GLORIOUS and the destroyers HMS ARDENT and HMS ACASTA are sunk by the German heavy battlecruisers SCHARNHORST and GNEISENAU 170 miles southwest of Narvik, Norway. Atlantic: In the same battle off Norway, the German cruiser ADMIRAL HIPPER sinks the UK tanker OIL PIONEER, armed trawler HMS JUNIPER and troop transport ship ORAMA. The HIPPER could have sunk the hospital ship ATLANTIS, too, but once she saw what it was, she let it go. ETO - Norway: Day 61 of 63 of the Battle of Norway. The evacuation of British and French troops from Narvik and Harstad is completed. The last French and Polish rearguard troops leave dummies in their place to buy themselves time to pull out. ETO - France: Day 30 of 44 of the Battle of France. German 5th and 7th Panzer Divisions cross the Seine River and capture the city of Rouen. To the east, the 14th Panzer Corps breaks through at Amiens. However, the 16th Panzer Corps continues to be held down in Péronne by the French 7th Army. CBI - China: Day 1,068 of 2,987 of the 2nd Sino-Japanese War. Day 207 of 381 of the Battle of South Guangxi. Day 39 of 49 of the Battle of Yichang. ETO - Germany: RAF launches the biggest bombing raid yet on Germany with 360 aircraft. Middle East: Day 1 of 37 of the Battle for Syria and Lebanon. British, Commonwealth and Free French troops invade Syria and Lebanon in Operation EXPLORER. The Syrians are promised independence if they will revolt against their Vichy rulers. MTO - Libya: Day 60 of 256 of the Siege of Tobruk. After two German air raids on Alexandria, Egypt, killing 400 people, 40,000 residents evacuate from the city. East Africa: Day 364 of 537 of Italy's East African campaign in the lands south of Egypt. CBI - China: Day 1,433 of 2,987 of the 2nd Sino-Japanese War. Atlantic: Day 146 of 169 of Germany's Second "Happy Time," during which U-boats sink 609 Allied ships with little risk. ETO: European Theater of Operations US Army (ETOUSA) is established by a presidential directive. Major General James E Chaney is designated commander of all US forces of ETOUSA. Germany: Fifteen Poles, including 12 women, are publicly hanged in Posen. Their bodies are left hanging for 48 hours as a warning to others. Russian Front - North: Day 274 of 872 of the Siege of Leningrad. Russian Front - North: Day 35 of 658 of the Siege of the Kholm Pocket. Russian Front - Center: Day 11 of 31 of Operation KREMLIN, a German diversion to trick the Soviets into thinking Moscow is their main objective instead of Stalingrad and the Caucasus. Russian Front - South: Day 222 of 248 of the Siege of Sevastopol, Crimean Peninsula. Bitter ground fighting breaks out as the Luftwaffe attacks shipping. MTO - Libya: Day 14 of 27 of the Battle of Gazala. A thick fog allows a supply convoy to sneak in and supply the French troops at Hakeim. The same fog allows the Axis to move into close positions for an upcoming attack. East Africa: Day 35 of 186 of the Battle of Madagascar. CBI - China: Day 1,798 of 2,987 of the 2nd Sino-Japanese War. Day 25 of 124 of Japan's Zhejiang-Jiangxi Campaign, launched to punish anyone suspected of aiding the Doolittle raiders in China. Roughly 250,000 Chinese will be killed. PTO - Alaska: Day 2 of 435 of the Battle of Kiska, Aleutian Islands. A scout plane from the US 11th Air Force over Kiska and Umnak Islands discovers Japanese naval units in Kiska Harbor. PTO - Australia: Day 9 of 9 of the Battle at Sydney Harbor. Japanese imperial submarines I-21 and I-24 shell the Australian cities of Sydney and Newcastle. PTO - Malaya: Day 110 of 357 of the Battle of Timor Island. USA: Day 9 of 9 of the Los Angeles Zoot Suit Riots. Major rioting subsides in Los Angeles, but will linger for another week or so. But large rioting has already begun to spread into other ports and urban centers such as Detroit, Chicago, Philadelphia and Harlem where African-Americans dressed in zoot suits become major targets. Russian Front - North: Day 639 of 872 of the Siege of Leningrad. Russian Front - North: Day 400 of 658 of the Siege of the Kholm Pocket. MTO - Italy: Day 18 of 20 of the naval and aerial bombardment of Pantelleria Island. MTO - Italy: US 9th Air Force RAF bombers attack the ferry terminal at Messina while US B-25s hit gun emplacements on Pantelleria Island. MTO - Italy: US 12th Air Force RAF Wellingtons night bomb targets at Pantelleria Island. During the day, US planes pound the island again while Naval forces bombard the harbor and shore batteries. CBI - China: Day 2,163 of 2,987 of the 2nd Sino-Japanese War. CBI - Indochina: US 14th Air Force B-24s and B-25s bomb targets at Hongay, Gia Lam and Hanoi. PTO: Day 13 of 47 adrift in a raft for the survivors of B-24 GREEN HORNET that crashed 850 miles from Hawaii. PTO - Alaska: Day 367 of 435 of the Battle of Kiska, Aleutian Islands. A C-47 for the US 11th Air Force is the first USAAF airplane to land on Attu Island. The plane is full of fighter crews to serve at Alexai Point. PTO - Dutch East Indies: US 5th Air Force B-25s bomb Koepang and hit the area southeast of Dili on Timor Island. PTO - Japan: Just north off Oshima Island, the Japanese battleship MUTSU suffers an accidental explosion due to an unknown cause, killing most of the crew. PTO - New Guinea: Day 48 of 148 of the 2nd Battle of Lae-Salamaua. US 5th and 13th Air Forces provide air support. PTO - Philippines: The USS FINBACK attacks a Japanese convoy sinking two transports ships and damaging another. PTO - Solomon Islands: US 13th Air Force B-24s bomb the Kahili Airfield on Bougainville Island and targets on Ballale Island. ETO - France: Day 3 of 49 of Operation OVERLORD, the Allied invasion of Normandy, France, known forever simply as D-Day. 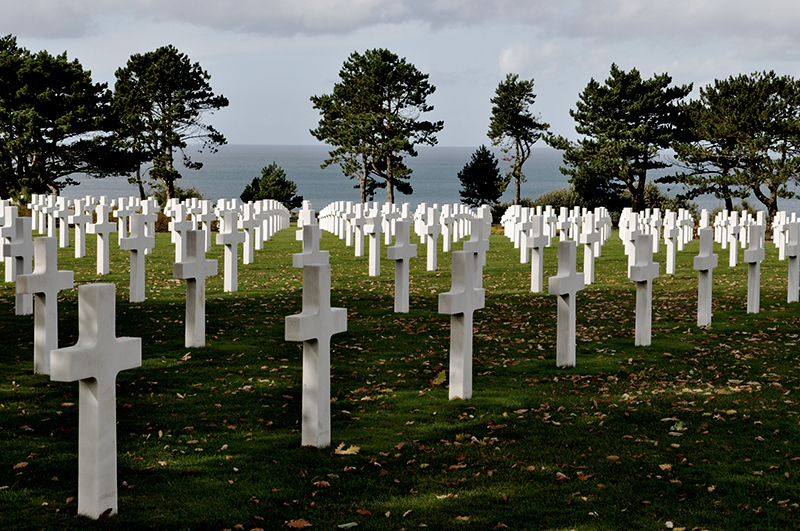 D-Day+2: The Normandy American Cemetery, overlooking Omaha Beach and the English Channel, is established as the first US cemetery in Europe during World War II. 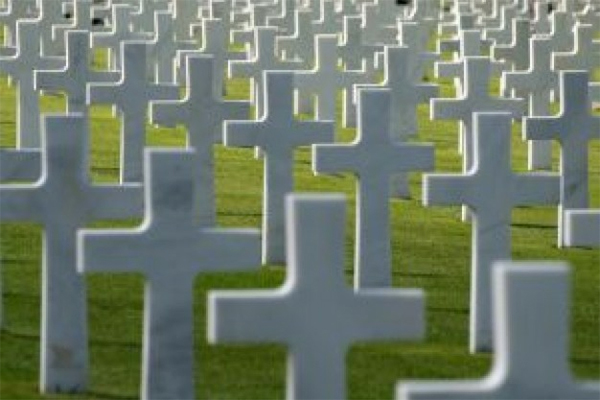 It will go on to hold the graves of more than 9,300 US servicemen who died in the D-Day invasion or subsequent missions. After the war, the present-day cemetery was established a short distance to the east of the original temporary site. Like all other overseas American cemeteries in France for World War I and II, France has granted the United States a special, perpetual concession to the land occupied by the cemetery, free of any charge or any tax. The cemetery is managed by the American government, under Congressional acts that provide yearly financial support for maintaining them, with most military and civil personnel employed abroad. The US flag flies over these granted soils. ETO - France: Day 3 of 62 of the Battle of Caen. ETO - France: Day 3 of 25 of the Battle of Cherbourg. Russian Front - North: Day 128 of 191 of the Battle of the Narva Isthmus, Estonia. Both German and Soviet troops remain locked in their defensive positions. MTO - Yugoslavia: US 15th Air Force B-17s bomb the naval yard and dry docks at Pola. MTO - Italy: Day 4 of 16 of the Battle of the Trasimene Line (north of Rome). Allied Air Forces provide air support. US 5th Army captures Civita Castellana. CBI - Burma: Day 96 of 166 of the UK's Operation THURSDAY. Monsoon season bogs down all operations. CBI - Burma: Day 91 of 147 of the Battle of Myitkyina. US 10th Air Force provides air support. Monsoon season bogs down all operations. CBI - Burma: Day 69 of 302 of the Chinese Salween Offensive. US 14th Air Force provides air support. Monsoon season bogs down all operations. CBI - China: Day 2,529 of 2,987 of the 2nd Sino-Japanese War. Day 53 of 259 of Japan's Operation ICHI-GO. CBI - India: Day 93 of 118 of the Battle of Imphal-Kohima. PTO - Caroline Islands: US 7th Air Force bombs targets on Ponape Island and in the Truk Atoll during the night. PTO - New Guinea: Day 13 of 83 of the Battle of Biak. 5th Air Force provides air support. PTO - New Guinea: Day 177 of 597 of the Battle of New Britain. US 13th Air Force provides air support. PTO - New Guinea: Day 48 of 481 of the Battle of Western New Guinea. 5th Air Force provides air support. PTO - Solomon Islands: Day 221 of 295 of the Battle of the Bougainville Islands. US 13th Air Force provides air support. Germany: One month after the fall of the Third Reich, the US Army reveals details of German plans that would have completed the extermination of all Jews in Europe by the summer of 1946. Slovakia: Jozef Tiso, Slovak Roman Catholic priest and President of the Nazi satellite Slovak State, is arrested. CBI - China: Day 2,894 of 2,987 of the 2nd Sino-Japanese War. Day 69 of 91 of the Battle of Zhijiang. US 14th Air Force provides air support. Japanese troops continue pulling out of China. PTO - Dutch East Indies: Day 39 of 52 of the Battle of Tarakan Island. The fleet minesweeper USS SALUTE is sunk by a Japanese mine while covering landings at Brunei Bay. PTO - Japan: At Kyushu, in an attempt stop kamikaze planes from taking off, fighters from USS TICONDEROGA attack the airfields while the USS MISSOURI bombards the bases. PTO - Japan: Day 69 of 83 of the Battle of Okinawa. PTO - New Guinea: Day 529 of 597 of the Battle of New Britain. US 10th Air Force provides air support. PTO - New Guinea: Day 413 of 481 of the Battle of Western New Guinea. US 10th Air Force provides air support. PTO - Philippines: Day 231 of 299 of the 2nd Battle of the Philippines, aka the Liberation of the Philippines or the Philippines Campaign. PTO - Philippines: Day 176 of 244 of the Battle of Luzon. 5th Air Force provides air support. PTO - Philippines: Day 91 of 159 of the Battle of Mindanao Island. 5th Air Force provides air support. PTO - Philippines: Day 83 of 135 of the Battle of the Visayas region. US 5th and 7th Air Forces provide air support. A thorough analysis of the processes of recovery, identification, return, burial, and remembrance of those that have fallen in combat. After Pearl Harbor, America and Hollywood experienced a sharp cultural transformation that made horror, shock, and violence not only palatable but preferable.